શેર લોટ સાઇઝ : 65 શેર. > મેટ્રોપોલીસ હેલ્થકેર આઇપીઓ નુ લિસ્ટિંગ 960 રૂપિયા એ થયું. આજે મેટ્રોપોલીસ હેલ્થકેર IPO નુ લિસ્ટિંગ છે. જે ક્લાઈન્ટ ને લાગ્યા હોય તે ડિમેંટ માં ચેક કરી આજ થી વેચી શકે છે. આજે RVNL(રેલ વિકાસ નિગમ લિમિટેડ) IPO નુ લિસ્ટિંગ છે. જે ક્લાઈન્ટ ને લાગ્યા હોય તે ડિમેંટ માં ચેક કરી આજ થી વેચી શકે છે. શેર લોટ સાઇઝ : 27 શેર. શેર લોટ સાઇઝ : 17 શેર. આઇપીઓ શેર રોકાણકારને લાંબા ગાળા માટે સારું વળતર આપશે નહીં. ટૂંકા ગાળાના રોકાણકારને લિસ્ટિંગ ગેઇનનો લાભ મળશે. તમે આઈપીઓ અને સ્ટોક ઇન્વેસ્ટમેન્ટ માટે તમારી સ્ટ્રેટેજી નક્કી કરો છો. HDFC AMC ALLOTMENT - LISTING ON 06/08/2018. Good Listing is expected ..
Retail Subscription : 2,68,052 applications Subscribe issue one time. Micro-lender CreditAccess Grameen Ltd will be raising up to Rs 900 crore through an initial public offer (IPO) early next month. The Bengaluru-based microfinance institution (MFI), formerly known as Grameen Koota Financial Services Pvt Ltd, will be filing a Red Herring Prospectus (RHP) with the Securities Exchange Board of India (SEBI), its Chief Financial Officer B.R. Diwakar told BusinessLine. The funds will primarily be utilised as growth capital and will be used for lending. "We should be able to utilise the money for the next 24 months. It will be the main ingredient for leveraging." With a total outstanding portfolio of Rs 3,937 crore as on September 2017 (according to the DRHP filing), CreditAcecess Grameen now has 16.06 lakh active customers. Credit Access holds 99 per cent stake in the MFI, which operates in five states -- Karnataka, Maharashtra, Tamil Nadu, Madhya Pradesh and Chhattisgarh. Total Issue – 2,68,05,394 Equity Shares = 1,131.19Crs. It has been the largest AMC in equity-oriented AUM since the last quarter of Fiscal 2011 and has consistently been among the top two asset management companies in India in terms of total average AUM since the month of August 2008..
4. 5 other schemes (including exchange-traded schemes and funds of fund schemes). The company also provides portfolio management and segregated account services to HNIs, family offices, trusts, domestic corporates and provident funds etc. As of December 31, 2017, it managed a total AUM of ₹75.78 billion as part of its portfolio management and segregated account services' business. 1. Brand reputation of HDFC and SLI helps in earning the trust of customers. The Promoters of the Company are HDFC and Standard Life Investments. HDFC holds 120,772,800 Equity Shares and Standard Life Investments, holds 80,515,200 Equity Shares, which constitutes 57.36% and 38.24%, respectively, of the Company's pre-Offer, issued, subscribed and paid-up Equity Share capital. 1. To carry out the sale of Equity Shares offered for sale by the Selling Shareholders. 3. Provide a public market for Equity Shares in India. The Company will not receive any proceeds from the Offer and all the proceeds from the Offer will be received by the Selling Shareholders. Incorporated in 2002, Mumbai based Fine Organic Industries Limited is a company engaged in manufacturing of oleochemical-based additives. As per CRISIL Research Report, it is the largest manufacturer of oleochemical-based additives in India and a strong player globally in this industry. The company produces a wide range of specialty plant derived oleochemicals-based additives used in the food, plastic, cosmetics, paint, ink, coatings and other specialty application in various industries. It has a range of 387 different products sold under the 'Fine Organics' brand. Fine Organics is the first company to introduce slip additives in India and is the largest producer of slip additives in the world. Its direct customers are multinational, regional and local players manufacturing consumer products, such as Hindustan Unilever and Parle Products, and petrochemical companies and polymer producers globally. The plastics additives and specialty additives are also used in the packaging of foods and other fast moving consumer goods. The company currently has three production facilities in Ambernath, Badlapur, and Dombivli in Maharashtra. As of December 31, 2017, these three facilities have a combined installed capacity of approximately 64,300 tonnes per annum. The company's products are also manufactured on a job-work basis by Olefine Organics ("Olefine"), a partnership firm and a Promoter Group entity, at a manufacturing facility in Ambernath, Maharashtra. It plans to take over the operation of the Second Ambernath Facility once Olefine has received the approval to enter into a sub-lease with us from MIDC, which is the owner of the land on which the facility is located, which is expected to occur in the fourth quarter of Fiscal 2018. The company has a dedicated research and development ("R&D") center located in Mahape, Navi Mumbai. The Company has 596 full-time employees on its payroll. The objects of the Offer are to achieve the benefits of listing Equity Shares on the Stock Exchanges and to carry out the sale of up to 7,664,994 Offered Shares by the Selling Shareholders. The listing of Equity Shares will enhance the Company's brand name and provide liquidity to the existing Shareholders. The listing will also provide a public market for Equity Shares in India. The Company will not receive any proceeds from the Offer and all the proceeds from the Offer, less Offer related expenses, will go to the Selling Shareholders. Incorporated in 2009, Mumbai based IndoStar Capital Finance Limited is a leading non-banking finance company (NBFC) registered with the Reserve Bank of India as a systemically important non-deposit taking company. The company operates four principal lines of business, namely corporate lending, SME lending, vehicle financing and housing financing. It recently expanded its portfolio to offer vehicle finance and housing finance products. 2. A high-quality loan portfolio with low rates of Gross NPAs and Net NPAs. 3. Proven track record of delivering results. Between fiscal 2013 and 2017, the company's Total Credit Exposure and total revenue grew at a CAGR of 30.0% and 31.4%, respectively. 4. Access to best industry practices and international corporate governance standards due to institutional Promoter. The Promoter of the Company is Indostar Capital. 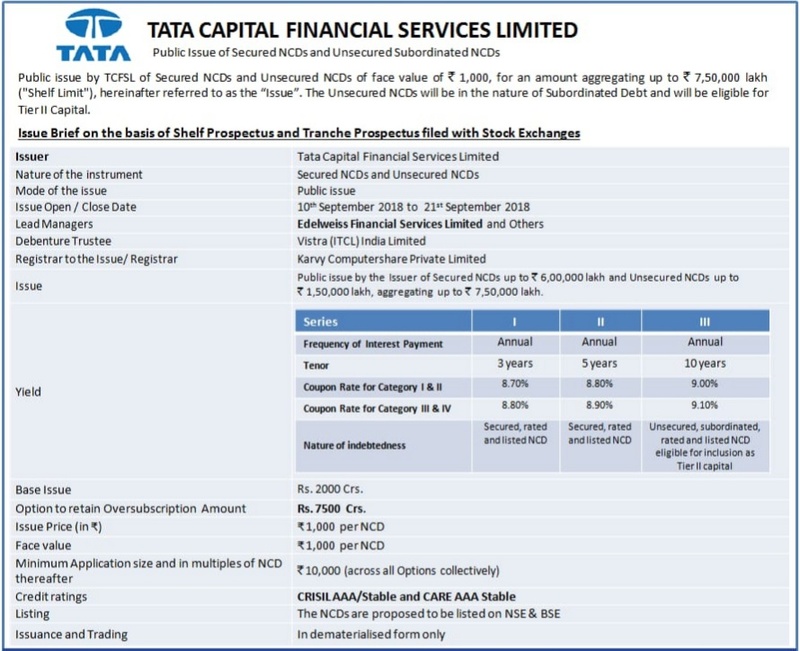 The Objects Of The Issue is to utilize the Net Proceeds from the Fresh Issue towards augmenting its capital base to meet future capital requirements. Incorporated in 1992, Delhi based Lemon Tree Hotels is India's largest hotel chain in the mid-priced hotel sector, and the third largest overall, on the basis of controlling interest in owned and leased rooms, as of 30 June 2017. The company operates in the mid-priced hotel sector and its hotels are located across India, in metro regions, including the NCR, Bengaluru, Hyderabad and Chennai, as well as tier I and tier II cities such as Pune, Ahmedabad, Chandigarh, Jaipur, Indore and Aurangabad. 3. 'Red Fox by Lemon Tree Hotels' which is targeted primarily at the economy hotel segment. As of July 31, 2017, the company have a portfolio of 19 owned hotels, three owned hotels located on leased or licensed land, five leased hotels and 13 managed hotels. It also has project design, management and development capabilities through its Subsidiary, Grey Fox Project Management Company Private Limited ("Grey Fox"). The Promoters of the Company are Mr. Patanjali Govind Keswani and SMSPL. The Promoters hold, in the aggregate, 184,784,311 Equity Shares which constitutes 23.49% of the Company's pre-Offer paid-up Equity Share capital. SMSPL was incorporated on November 5, 2004 and is primarily engaged in the business of designing, managing, supervising and executing hotel projects. Mr. Patanjali Govind Keswani is the natural person in control of SMSPL. 2. Sale of up to 195,797,000 Equity Shares by the Selling Shareholders. They provide equity capital market products including initial public offerings (IPO), further public offerings, rights offerings, convertible offerings, qualified institutional placements, non-convertible debentures, buyback, delisting, and open offers and international offerings for unlisted and listed entities. They offers their services to corporates, financial institutions, high net-worth individuals, and retail investors. The company operates ICICIdirect.com, an online broking platform for investors to invest in equity, derivatives, currency futures, mutual funds, and other financial products, as well as to access research information, stock picks, and mutual fund recommendations. As of September 30, 2017, ICICIdirect had approximately 3.8 million operational accounts of whom 0.7 million had traded on NSE in the preceding 12 months. Since inception, the company had acquired a total of 4.4 million customers through this platform as of September 30, 2017. As on September 30, 2017, ICICI Securities' retail brokerage and distribution businesses consists of over 200 of our own branches, over 2,600 branches of ICICI Bank through which our electronic brokerage platform is marketed and over 4,600 sub-brokers, authorised persons, independent financial associates and independent associates. ICICI Bank Ltd is the promoter of the company. ICICI Bank currently holds 322,141,400 Equity Shares, equivalent to 100% of the pre-Offer issued, subscribed and paid-up Equity Share capital of the company. 2. Listing of Equity Shares will enhance its visibility and brand image and provide liquidity to its existing shareholders. Incorporated in 1973, Mishra Dhatu Nigam Ltd is Hyderabad based PSU engaged in the business of manufacturering of special steels, superalloys and titanium alloys in India. These high value products cater to niche sectors including defense, space and power. Company is Mini Ratna, Category-I company since 2009. 1. Special steels like martensitic steel, ultra high strength steel, austenitic steel and precipitation hardening steel. 2. Three varieties of Superalloys - nickel base, iron base and cobalt base. Mishra Dhatu Nigam has a manufacturing facility in Hyderabad. Compant is in the process of setting up two new manufacturing facilities in Rohtak and Nellore. Company has an in-house research and development team comprising of 14 officers. Company has 836 employees. The promoter of the company is the President of India acting through the Ministry of Defence, Government of India. Based on the EPS for the year ending March 31, 2017, P/E at the floor price is 12.91 times and at the Cap Price is 13.35 times. Since, there are no comparable listed companies in India engaged in the similar business, comparison with industry peers are not available. Incorporated in 1987, Sandhar Technologies Limited is New Delhi, India based company engaged in the business of designing and manufacturing a diverse range of automotive components, parts and systems, largely focused on safety and security systems of vehicles. The company is a leader in the two-wheeler locking systems market, and the commercial vehicle rear view market in India., and are one of the two largest companies catering to the commercial vehicle locking systems market, and the two wheeler rear view market in India. It is also one of the two largest manufacturers of operator cabins in India, along with being the largest player in the excavator cabins market. The company manufacture its products from 29 manufacturing facilities across eight states in India, two manufacturing facilities in Spain, and one manufacturing facility in Mexico. The company's customer portfolio consists of 79 Indian and global OEMs across various segments including Ashok Leyland, Doosan Bobcat, Escorts, Hero, Honda Cars, Komatsu, Scania, TAFE, Tata Motors, TVS, UM Lohia, and Volvo etc. In the last 12 years, the Company has received investment by two private equity investors, namely Actis Group and GTI. As of October 31, 2017, it had a total work force of 7,744 individuals comprising of 2,363 employees, and 5,381 individuals engaged on contractual basis. The Promoter of the Company is Mr. Jayant Davar. The Promoter directly holds 31,306,426 Equity Shares (inclusive of the 90,909 Equity Shares held by him in his capacity as sole proprietor of Sandhar Enterprises), representing 61.20% of the pre-Offer issued, subscribed, and paid-up capital of the Company. Promoter of HAL is the President of India, acting through the Department of Defence Production, Ministry of Defence. The promoter currently holds, 100% of the pre-Offer paid-up Equity Share capital of the Company. Assuming the sale of all Offered Shares, the Promoter shall hold around 90% of the post-Offer paid-up Equity Share capital of the Company. Incorporated in 1970, Bharat Dynamics Ltd is Hyderabad based wholly-owned GoI company engaged in the manufacture of Surface to Air missiles (SAMs), Anti-Tank Guided Missiles (ATGMs), underwater weapons, launchers, countermeasures and test equipment. Bharat Dynamic have three manufacturing facilities located in Hyderabad, Bhanur and Vishakhapatnam. Company is the sole manufacturer in India for SAMs, torpedoes and ATGMs. Company is also the sole supplier of SAMs and ATGMs to the Indian armed forces. Additionally, company is engaged in the business of refurbishment and life extension of missiles manufactured. Company is intend to offer products such as Akash SAM, light weight torpedoes and countermeasure dispensing system to the international markets in near future. 1. Modern facilities and infrastructure to deliver quality products in a timely manner. 2. Increase in indigenisation of our products and implementation of the 'Make in India' policy. 3. Strong order book and established financial track record of delivering growth. Incorporated in 2014, Bandhan Bank Limited is Kolkata, West Bengal based commercial bank focused on micro banking and general banking services. Bandhan Bank has a license to provide banking services pan-India across customer segments. Bank offer a variety of asset and liability products and services designed for micro banking and general banking, as well as other banking products and services to generate non-interest income. With the a network of 2,546 doorstep service centres (DSCs) and 9.47 million micro loan customers, the bank has strong very hold in microfinance. Bandhan bank has 864 bank branches and 386 ATMs serving over 1.87 million general banking customers. Banks distribution network is strong in East and Northeast India, with West Bengal, Assam and Bihar. 3. Other banking products and services including debit cards, internet banking, mobile banking, EDC-POS terminals, online bill payment services and the distribution of third-party general insurance products and mutual fund products. The Promoters of the Bank are BFHL, BFSL, FIT and NEFIT. of carrying out non-banking financial activities without accepting public deposits. 2. BFSL was accorded in-principle approval by the RBI on April 9, 2014 for setting up a bank in the private sector. The promoter of BFHL is BFSL. 3. FIT is an irrevocable charitable trust with objectives including inter alia eliminating functional illiteracy in India by making education economically relevant. 4. NEFIT is an an irrevocable charitable trust with objectives including inter alia eliminating illiteracy in India by making education available to the underprivileged. The Issue comprises of a Fresh Issue and an Offer for Sale.